Leaf blowers with bags is one thing, but a snow blower with a bagging attachment is a completely different story. That's not something you see everyday. If you're looking for a slightly humorous Christmas card to send over the holidays this year, this one will surely do the job. All our cards are printed in the U.S. on top quality recycled paper. That snow would be recyclable too if it wasn't blown in a bag... What a shame! NobleWorks' humorous greeting cards have been making people blush since 1980 BC (Before eCards). 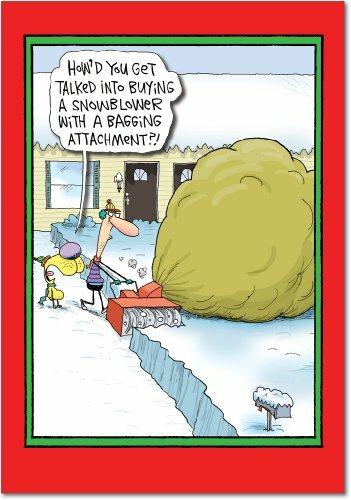 We offer a huge selection of hilarious Christmas cards to make the season even more merry. Our shameful, over-the-top, hilarious holiday designs can be ordered individually, or in sets of 12 – if you know that many folks with a twisted sense of humor. All of our funny cards are printed on-demand (and we are very demanding!) in the good ol' US of A on thick, bright, premium recycled paper. Many of our fabulous cards are also available blank to appease one's closeted creative urges, some even come jumbo sized – oh snap, size does matter after all! There are merely about 7,000 hilarious cards in the collection, from silly to slightly risquÃ, for a plethora of everyday and seasonal occasions. Dare to laugh!